As classes resume and temperatures drop below twenty degrees, Weinberg freshman Bart Wixler has begun preparations for a grueling three months of having to politely listen as people complain about the weather. A Miami native, Wixler expressed concerns about having to face his first true winter. “I don’t know if I’ll be able to handle it. I mean, how many times can you have the same conversation about wind chill? 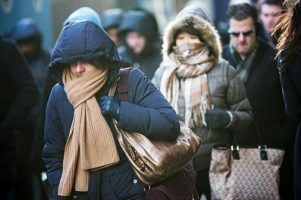 Everyone here says that the complaints I’ve heard back home are nothing compared to how much people complain during a real Chicago winter.” Fortunately for Wixler, his worried mother bought him a manual from The North Face containing pre-written responses to common weather complaints in case he runs out of things to say. Wixler’s situation is not unique. According to experts, climate change will cause even more frequent and annoying complaints over the next century. If countries don’t increase their efforts to reduce whining and grumbling emissions, the complaining could reach irreversibly dangerous levels by 2020.